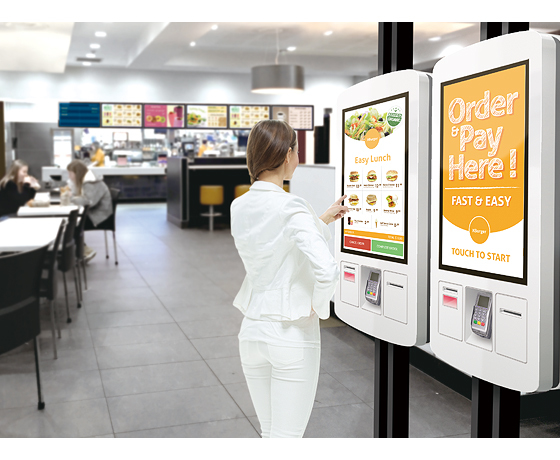 One of the largest quick service restaurant chains in the world has embarked on quest to build self-service kiosks for some of its outlets to expand services and speed the ordering process. With the aim to reduce queuing times and provide customers a pleasant and convenient ordering experience, the restaurant chain sought to create an interactive in-store digital experience akin to ordering at the counter. The need for a kiosk system to deliver touchscreen interactivity and support self-checkout devices has led the restaurant chain to NEXCOM's digital signage players. 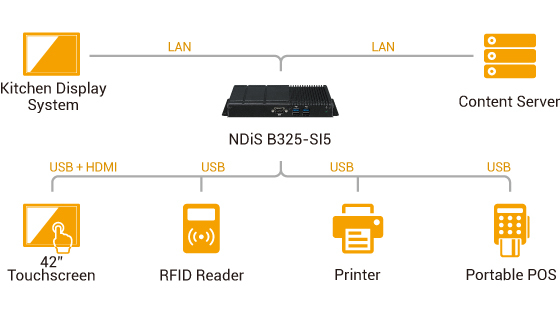 Installed in a kiosk stand, the NEXCOM digital signage player connects a large 42-inch touchscreen display to provide customers an intuitive interface for placing orders, and self-checkout devices like external printer, RFID and POS reader for making payments. The digital signage player also connects to the restaurant kitchen display system (KDS) and content server over Ethernet connection, enabling the self-service kiosk to display all the menu items in synchronization with the menu available at the counter, including special promotions and exclusive daily deals. Not only the customers can place orders like in service counters on the self-service kiosk, the customers can also customize orders such as the choice of different toppings and sauces. After placing the order, customers can proceed to make payments using credit cards or contactless smart cards. Upon payment, a receipt with an order number will be printed to customers to allow them to track when orders are ready for pick up on a KDS screen showing order status. With NEXCOM digital signage players powering the self-service kiosks to provide a complete digital service counter experience from start to finish, the restaurants not only reduced queuing times, but also expanded service capacity and increased revenue.